Whether its flight attendants or bus hosts, these people are the real deal. They protect people’s safety like stylish and modern superheroes. They’re also responsible for giving a positive chilled-out vibe; keeping you safe and serving you food? These professionals deserve our praise. After that, the passenger, very rudely told her that she’s no one to question him and he can do whatever he wants since he’s the customer and of course, the customer is always right? We don’t think so, not in the following case. The writer mentioned that the passenger who misbehaved with the host said, “Mein tumhe iss bus se phenk dunga aur tumhe yahan se lejaunga kaheen aur phir jo karunga tumharay sath wo dekhna” and he started using bad language. The lady burst into tears after this and some fellow passengers calmed her down. After this, the bus was stopped and she came inside was about to kick the passenger off the bus until the man said that he’s from the FIA and he will not spare anyone who tries to complain against him. He basically used his position to make sure that no one goes against him. Here’s the video of the entire scene! 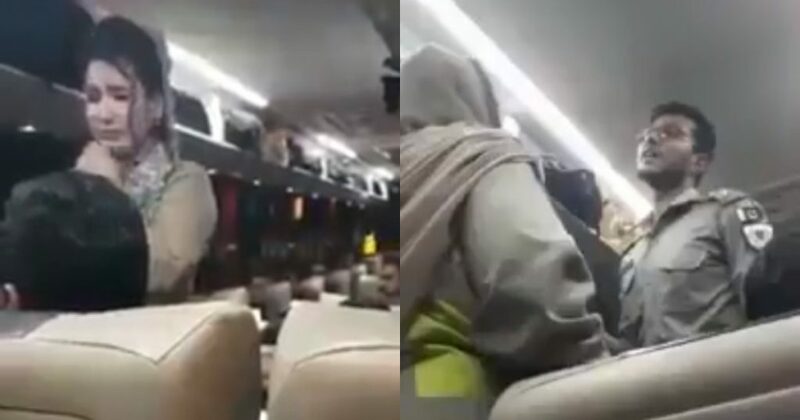 The man stated that after listening to this, the policewoman attempted to reduce the tension between the passenger and the bus host but the lady who tolerated his behavior did not accept his apology and demanded a case to be filed against him. The writer stated, “I and all passengers stepped outside the bus with her and talked to the motorway police to get him off no matter what he might be from or what his rank might be.” Later the man was taken, hostage. Some users said that this should be taken to supreme court. Everyone has the right to work and live in an environment that’s free from inappropriate touching, discrimination, and unethical living ambiance. People who use their power to show others that they can be anything they wish for are living in a bubble. It’s high time that actions are taken against such people who mistreat women publicly and think that they can get away with it! Let us know what did you all think of this in the comments below.